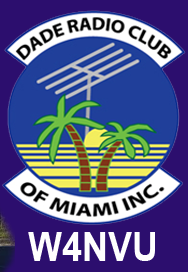 August – W4NVU – Dade Radio Club of Miami Inc.
Meeting was called to order at 19:38 with 29 present. We have a quorum. Brandon presided over the meeting and welcomed everyone. Julio is working. The meeting was not broadcast live on the air tonight from the EOC. There was testing being conducted in another room tonight. Everyone took turns and stated their name and call sign. Brandon welcomed everyone again. Secretary: Approval of the minutes is tabled until next month. See Joanne to sign in. Corresponding Secretary: Lloyd is not present tonight. He is working. Treasurer – Brianna is not present tonight. Ryan is in testing. The website is working. Club Elmer/PIO – Miguel not present tonight. He is working. Hambulance – Jason advised that Julio has the batteries. Brandon explained to those new members what our hambulance is. Ray said that we need to get the keys so that it can be pushed to a place to get power. Brandon will email Julio. Winter Field Day – Will take place December 2 – 3rd with the Everglades Club at the Aerojet site. More info TBA. Hurricane checklist by Ray – go to hurricanechecklist.com. Ray spoke about the website. It’s one page. Everyone should get ready. The 147.000 – Jason said he’s making slow and sur progress. The club is going to have to pay for a tower crew. It will cost between $6,000 and $8,000 and we are going to need a new antenna. The 147.760 – Ray said it’s up and running. Brandon will work it back into the nets. Jason advised that the tower at UM is going to come down in about two years. The 444.200 – Carl was not present tonight. Brandon advised that it is up and running and works great. Keep using it. It is going to be moved to a bigger tower near Bird Road and FPL. Jason said it will be easy and it will be better. D-Star –Brandon asked if anyone is using it and no one replied. Emergency Committee – Lloyd was not present tonight. He is working. Net Manager – Brandon advised that the nets are still taking place every week. He reminded everyone that we are in the middle of the hottest part of hurricane season. Soon will be the anniversary of Andrew. Be ready. Have everything that you need. Watch your emails. Virgil gave a presentation on Ham certificates on your wall. CQ DX Marathon. Contact other stations. The instructions are on the website. He has QSL cards from each month for anyone that wants to look at them. Great presentation Virgil. Thank you! Lee held an auction of equipment. He collected $191.00 for the club and $50.00 for the Abrams estate. Great job Lee!! Brandon advised that we have 2 new techs tonight, 1 general and 1 extra tonight from testing. Congratulations!!!! Brandon asked if there was any other old business. There was none. Brandon asked if there was any new business. There was none. Brandon thanked everyone for coming. Harry made a motion to adjourn, seconded by Jason. The DRC meeting was adjourned at 20:31.